In less than a week, my new book Veganize It! Easy DIY Recipes for a Plant-Based Kitchen will hit the shelves. To celebrate, we’re having a blog tour. Over the next few weeks, you can visit some fantastic blogs and websites to check out some sample recipes, photos, and reviews of Veganize It! and also enter giveaways to win a copy of the book. Having written more than 20 cookbooks, Veganize It! may be my most personal favorite of all because it comes full circle to when I first went vegan nearly 30 years ago and began to “veganize” all our favorite foods. In this book, I’ve organize the recipes to share not only veganized ingredients but also recipes that use those ingredients. 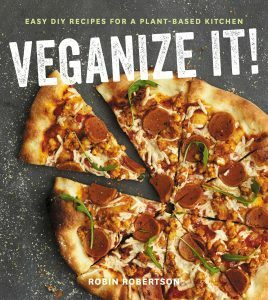 So, whether you need basic DIY recipes such as vegan sour cream or seitan, or want to make a “soup to nuts” meal from appetizer to dessert, you’ll find the recipes in Veganize It! Here’s a list of dates and locations of the blog tour…beginning with Vegan Huggs where you’ll find my recipe for Smoky BBQ Pulled Jackfruit Sandwiches. Check back here frequently for changes, updates, and direct links to the posts as they happen. Thanks in advance to everyone participating in this blog tour to celebrate the publication of Veganize It!